W.A.V. 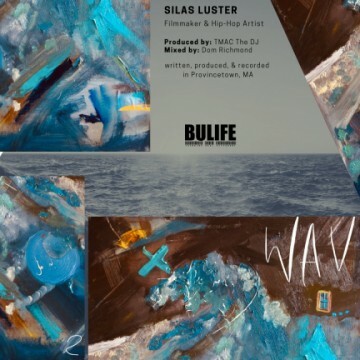 is a new EP from Silas Luster, a filmmaker and hip hop artist based in Provincetown, Massachusetts. The album was produced by @TmacTheDJ and recorded locally. Silas is a member of a creative collective known as “The BuLife,” which claims to value honesty and transparency. W.A.V. is pretty solid musically. The eerie, synth driven backing beats provide a heightened tension for the songs. Silas has a crisp delivery and impecacble timing. While other rappers “spit rhymes,” Silas Luster delivers them clearly and melodically. His voice can be subtly emotive and dynamic as well. This isn’t a guy who yells and postures into the microphone, and yet still you can tell he means business. One of the best songs on this EP is What’s Love? It’s a flawless spoken word poem with only light “waves” in the background. Other notable tracks are 2004 (it was a great year for me actually) and Moldamensions. Moldamensions the backing music for which sounds like something you’d hear in an episode of Tales From the Darkside. Anyway, W.A.V. is an impressive little release, and you should probably check it out for yourself.